Blackinton B1660 Round Wreath Badge with Eagle - B1660 - 2 1/2" x 3 1/4"
Home > Blackinton > Police Badges > Badges with Eagles > B1660 Round Wreath Badge with Eagle - B1660 - 2 1/2" x 3 1/4"
B1660 Round Wreath Badge with Eagle - B1660 - 2 1/2" x 3 1/4"
The Blackinton Round Wreath Badge with Eagle style B1660 is a beautifully crafted identifier of the men and women who daily put their lives on the line so that we may be secure. It is appropriately embellished with an iconic spread winged eagle and has two panels for pertinent information such as rank and company. A center space is provided for affixing a seal. 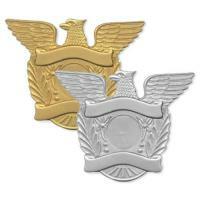 This shield measures 2 1/2" x 3 1/4" and is available in your choice of either gold or silver cast metal. This badge from a company famous for quality will surely endure. You will wear your shield proudly knowing that it was made with pride in the United States of America. Please allow four to six weeks for customization and delivery of your order. ©2002-2019 CopsPlus.com: Blackinton B1660 Round Wreath Badge with Eagle - B1660 - 2 1/2" x 3 1/4"